Science fiction by writers not typically known for their science fiction – that is the essence of this collection of short stories. Eric Puchner’s “Beautiful Monsters” is a wonderful sci-fi tale and as it is one of the early stories, it might strike some readers as a being written by someone who’s written a lot of sci-fi. It deals with aging and a future where the ‘problem’ of aging has been solved, only to create a new set of concerns (particularly for those who still age. “We Are the Olfanauts” by Deji Bryce Olukotun is one of the ‘hits’ of the book. Corporate culture and social media in the future are examined in an all-too-real possibility. “In the Bushes” by Jami Attenberg made me chuckle, though there isn’t much ‘meat’ to the story. It was a nice diversion from the often ‘heavy’ themes in sci-fi. “Monstro” by Junot Diaz is a story that is not to be missed – but warning … this is the first chapter of a novel that may or may not be forth-coming. Two college roommates and a girl whom one of them adores are together when a new plague breaks out. Cue a new zombie…. Over-all, a decent collection. It’s a great gift for the sci-fi reader who might not normally pick this up because it doesn’t have enough authors that are familiar to the genre reader. Looking for a good book? 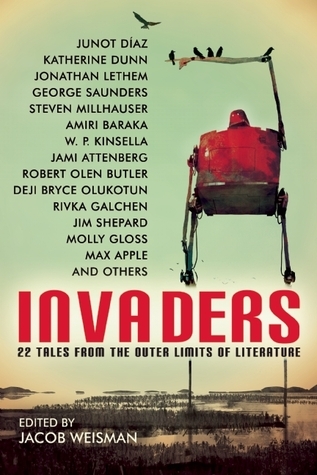 Invaders is an anthology of sci-fi stories by literary writers not typically known for their sci-fi and is worth a read for its unusual authorship and some quality stories.